Impact evaluation looks to assess the change attribute to a particular policy or project. Impact evaluations seek to answer cause-and-effect questions. Check for example what I wrote about impact evaluation. 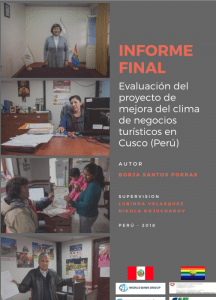 My contribution in this field has been to evaluate projects like in Cusco (Peru) with the World Bank, where we evaluated the impact of an intervention in different municipalities. The World Bank supported different offices of the government of Cusco to simplify the authorizations needed to open a business. My job was to evaluate the quantitative impact of that intervention in the informality, investment and employment and also unintended effects.